Many biological molecules exist in multiple variants, such as proteins with different posttranslational modifications, DNAs with different sequences, and phospholipids with different chain lengths. Representing these variants as distinct species, as most biochemical simulators do, leads to the problem that the number of species, and chemical reactions that interconvert them, typically increase combinatorially with the number of ways that the molecules can vary. This can be alleviated by “rule-based modeling methods,” in which software generates the chemical reaction network from relatively simple “rules.” This chapter presents a new approach to rule-based modeling. It is based on wildcards that match to species names, much as wildcards can match to file names in computer operating systems. It is much simpler to use than the formal rule-based modeling approaches developed previously but can lead to unintended consequences if not used carefully. 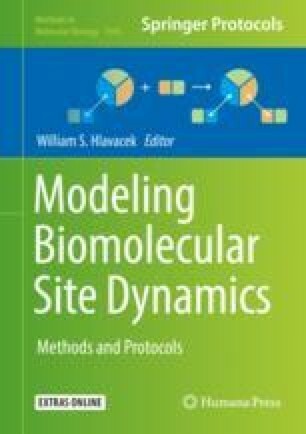 This chapter demonstrates rule-based modeling with wildcards through examples for signaling systems, protein complexation, polymerization, nucleic acid sequence copying and mutation, the “SMILES” chemical notation, and others. The method is implemented in Smoldyn, a spatial and stochastic biochemical simulator, for both generate-first and on-the-fly expansion, meaning whether the reaction network is generated before or during the simulation. The online version of this chapter ( https://doi.org/10.1007/978-1-4939-9102-0_8) contains supplementary material, which is available to authorized users. I thank Ronnie Chalmers, Akintunde Emiola, Jim Faeder, and Karen Lipkow for useful discussions. Much of this work was carried out during a visit to the Isaac Newton Institute for Mathematical Sciences, for which I thank Radek Erban, David Holcman, Sam Isaacson, and Konstantinos Zygalakis, who were the program organizers, and the institute staff. I also thank Roger Brent, Erick Matsen, and Harlan Robbins for providing space for me at the FHCRC, where the work was completed. This work was supported by a Simons Foundation grant awarded to SSA and by EPSRC grant EP/K032208/1 awarded to the Isaac Newton Institute.